Eddie Conard is a strong band leader and lead vocalist as he has proven over the years with his own bands on festivals through out Europe, be it with his band “Eddie C ” (ECSB ) or smaller combinations like “Soulful” and ”Primrose Path”. Music with art are also a passion for Eddie as he is the co- producer with projects such as “Art Beats” a combination of music and live art. Eddie is not only a percussionist, singer, songwriter and producer but also a music guru in various music workshops as described by his colleagues. These workshops can also be used for team building events which can be tailored to fit your needs or theme. JAZSOL is a music concept that describes the kind of music Eddie makes. JAZSOL is a blend of Jazz, Soul and Latin with a slight touch of pop making it something for all ages. Eddie also works sometimes as DJ for small parties or events creating a real ” feels good ” atmosphere. As a percussionist and sideman Eddie C became more famous in and out of Holland. International artists contracted him for their European tours. Artists like Gino Vannelli, Chaka Khan, Eros Ramozzotti, the late Timi Yuro, Wall Street Crash, Madeline Bell ,Jack Van Pol and Soul Sister, in a European tour with Sting just to name a few. In Holland he was the session- percussionist on records and live with many Dutch artists like Kane, René Froger, Rosenberg Trio, Laura Figy, Candy Dulfer, Lee Towers, Dana Winner, and Rob de Nijs. Eddie also performed with many of the Dutch dj’s and is a member of Beats and Strings. Dutch guitarist Frank Peeters is a graduate from the Hilversum Music College in The Netherlands. He’s a very diverse musician incorporating a wide range of styles and influences in his playing. Although a fabulous technician capable of playing basically in every setting with authority, Frank prefers spiritual interplay in a small group setting. Frank is at his best when the music gets the chance to breathe and interact, letting the music speak for itself instead of showing off his mighty chops. He has worked in several musical settings over a career spanning over some 20 odd years. Even before graduating in ’89, Frank performed at the prestigious North Sea Jazz Festival on several occasions and played the Jazz Mecca Festival. Sharing the stage with the likes of jazz saxophonists Bop Sheppard (Steely Dan) and Ernie Watts (Aretha Franklin, Stevie Wonder) or with renowned vocalists Mark Murphy and Greg Walker (Santana), he has developed a broad scope on music and doesn’t just stick to the jazz idiom. Whether it’s jazz, pop, soul, funk or r&b Frank has done it, lived it, worked it, and has now incorporated all these styles in his music, cooking his own musical stew which he prefers to call “pop jazz”. A few years ago Frank toured the US with the Swing Design Big Band making stops at prestigious venues in NYC and Las Vegas. While growing up Frank was fascinated by the duo recordings Ella Fitzgerald made with guitar wizz Joe Pass. More recently, he has found inspiration in the likes of Tuck Andress and Patti Cathart, better known as Tuck & Patti. It is this combination that has stolen Frank’s heart and the combination that forms the soil on which his recent collaborations thrive. 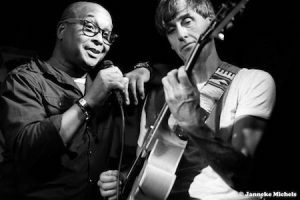 Together Eddie and Frank sound like a small band instead of duo performing Jazzy Soul and Blues with a light Latin touch at times and the style of the guitar playing of Frank plus cajon , bongos and Eddie’s voice, Soulful will touch your soul.